Tragically, an estimate of 3.5 deaths per day occurred in British Columbia in May of 2018 due to opioid overdoses. 71 per cent of those dying in 2018 were between the ages of 30 to 59. Overdoses happen frequently in the streets, but also behind closed doors. As a matter of fact, addiction is a tribulation that can affect anybody in any walk of life. In British Columbia, the crisis has caused a ripple of tragedies and St. John Ambulance, leading first aid and safety charity, has been committed to fighting this calamity since 2016. Recently the organization launched the Opioid Overdose Response Training program, which is a free program that trains people on how to assist a person suffering from an overdose. This vital training is being offered in Kamloops and a number of other locations across the province. The program was created to help bring awareness, reduce stigma and discrimination, and help bring life-saving tools to those who need them. The course is extremely thorough and ensures that those receiving the training become comfortable providing first-aid assistance. Through the program, individuals will learn how to administer naloxone, a life-saving drug that reverses the effects of an opioid overdose. St. John Ambulance also partnered up with the BC Central for Disease Control to supply participants with a free naloxone kit. Another main focus of the course is teaching how to give artificial respiration, which is key to keeping someone who’s having an overdose alive. Finally, the course also covers an area that many similar programs often miss: ongoing care. This is crucial since most people do not even deliberate on what the next steps are to take after aiding someone suffering from an overdose. It is also critical to consider the complications an individual could face in the aftermath of an overdose when they’re attempting to recover. This admirable initiative of St. John Ambulance is already having a strong positive impact. 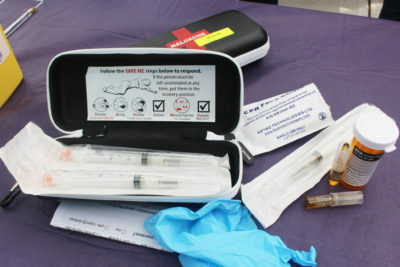 As of August 15, 2018, British Columbia had distributed 114,170 take-home naloxone kits. Alas, without the proper training not everyone is confident or willing to dispense injections or give artificial respiration to someone in need of it. This is an issue the program aims to solve and it’s proving highly effective. In fact, the willingness to intervene in an opioid overdose increases from 15 per cent, before taking the course, to 98 per cent after completing it. Furthermore, the number of overdose deaths is steadily decreasing compared to last year, this accomplishment can be attributed to the notable work that is being done across British Columbia to combat the crisis. At the present time, the Opioid Overdose Response Training is available and will continue to run at least until the end of the year. Anyone interested in learning more is encouraged to visit the website https://www.startsavinglives.ca/ where there’s a calendar showing all the dates of the upcoming courses. Hopefully, organizations across the country will take action and create similar programs, where hundreds of individuals can receive the knowledge and the tools to help save a life.